An apparition is something that unexpectedly appears that is either a ghost or ghostly. If someone is deified, they are either made into a god or adored like one. If someone is rotund, he has a round and fat body. A visceral feeling or attitude is strong and difficult to control or ignore; it arises through instinct or “the gut” rather than through careful thought. The Greeks used anthropomorphic or humanlike gods to explain natural phenomena. The anthropomorphic Poseidon was imagined to be a huge man who could use his trident to stir up the sea or crash into the ground to cause earthquakes. His brother Zeus, the king of the gods, possessed an anthropomorphic, human-shaped body that was strong and muscular, easily capable of hurling thunderbolts across the sky. 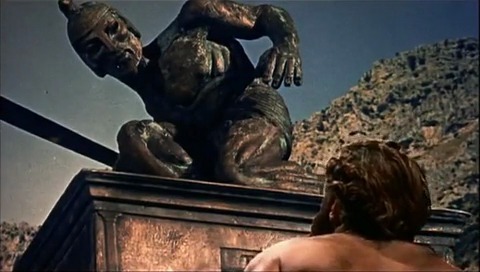 Often cultures will make their gods anthropomorphic or possessing human characteristics to make them more accessible to their human worshipers. Quiz: Try again! What do anthropomorphic beings have? They have a desire to be human, although they are not. They possess human characteristics and form. They have a love for humanity. Something anthropomorphic is not human but is shaped like a human or has human characteristics, such as behavior. Jason and the Argonauts The anthropomorphic statue of Talos comes to life!